Have you ever wanted to embrace a friend or loved one, but decided against it for fear of having to remove your hands from your warm pockets and expose them to the freezing air? Of course you have. Who hasn't? 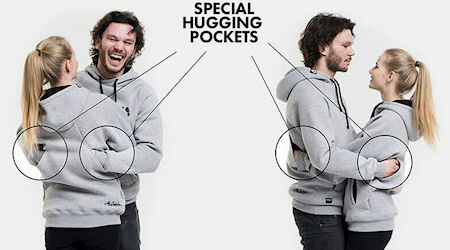 Together Wear - a line of hoodies designed with special back pockets for chilly hands - is here to solve this common dilemma.